Editor’s Note: Since Philadelphia is known as a city of neighborhoods, we asked Temple Law students, faculty, and staff to talk about what they love, hate, and can’t live without in their neighborhood. See every neighborhood covered thus far. Having come from North Jersey, Philadelphia was always an accessible city for me. In my early college years I visited Philly with friends from school, and fell in love with it. My first introduction to South Philly was visiting my friend’s house on Daly Street. What caught my eye on that nice spring day back in 2014 was how homey the neighborhood felt. Adjacent neighbors passed baking ingredients on porches, and everyone waved as we walked by. Both of our families in North Jersey were happy to hear that! We ended up at an apartment below East Passyunk, a short (7 minute) walk from the restaurants, bars, and farmer’s market—every Wednesday! Big Charlie’s Saloon, a Kansas City Chiefs bar oddly enough located in South Philly, is on our walk to and from the subway. The regulars, as we call them, know us by name and have become a second family. From offering umbrellas when it rains, to lending tools when we need an obscure type of wrench, they never hesitate to help us and continue to look out for us. The best thing about South Philly is the fact that living here makes you part of a family. It’s also an easy walk (another 7 minutes) to get to the subway stop, and I take the Broad Street Line up to Temple. My commute to school takes me roughly 25 minutes door to door, and I love to have the time to review my notes, listen to podcasts, or just blast music. It’s a quiet neighborhood with easy access to the shops on Passyunk and a 10 minute commute to Center City. My neighbor gets our packages sometimes, has fixed our dishwasher, and always invites us to his parties. The community really cares about each other down here, and it’s nice to be away from school and CC. What I hate about South Philly is that things are more spread out than in Center City. Although there are more populated pockets, you’ve got to know that the further you get from Broad Street, the further you also get from a lot of restaurants and bars. Also, another thing is that the parking, unless you have a garage or a parking space reserved, is absolutely atrocious. Tiny streets combined with many residents makes parking stressful at most hours. I have a lot of favorite spots in South Philly, but they can be a little random. The Vegan Commissary is a nice walk-in shop for pre-made vegan dishes. Bok Bar is a seasonal bar (only summer and into early fall) that is located on the roof of an abandoned high school and has a gorgeous view of the city. South Philadelphia Tap Room is another cool bar, with amazing food. The tapas restaurant Barcelona just opened as well, and it’s going to be famous in a year, I’ll bet money on it. Brew is an awesome coffeeshop that also serves beer, for those more stressful study sessions. I spend a lot of my time at the Starbucks on Broad, but another good study spot is B2 on Passyunk. Overall, good food and drinks are plentiful in South Philly. 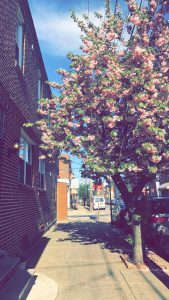 The bottom line is that if you want an easygoing, calm neighborhood, with a lower rent than most other pockets of the city, South Philly is the place for you. Accessible and walkable, South Philly has it all, from restaurants, to bars, to festivals (for sausages, cars, and Halloween, respectively). You’ll recognize the accent as soon as you cross Tasker. You’ll be warmly welcomed!